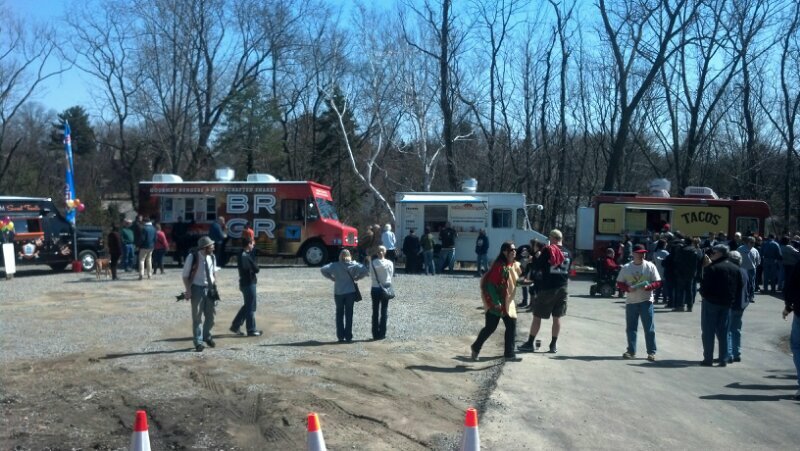 Today was the second installment of the food truck roundup at Coffee Buddha in the north hills. The sun was out and so were the people. Hundreds of people flocked to the back parking lot of the hipster coffee bar to get food served from the side of trucks. In addition to pack leader PghTacoTruck who calls Coffee Buddha home 4 days a week, they were joined today by Oh My Grill, Franktuary, BRGR Truck, Sweet Treats truck, Dozen Bake Shop, PghPierogi truck and Fukuda. We arrived right at noon and took advantage of our early bird timing to get pierogis and hot dogs before heading into CB for coffee drinks. The pierogis were only $2.50 for a trio of potato and cheese. Though they fell a little short for TasteBudA on flavor, who typically only eats only his mom’s legendary pierogis, they got us going for the day. The girl working the Franktuary truck was very excited that their 2013 debut was at this event. TasteBudA got sauerkraut on a standard dog, while I opted for the fresh chopped onion. Each dog was only $3 with topping. Inside Coffee Buddha, the motif took advantage of the name buddha and had many ceramic and artwork to thematically set the mood. I got the signature “Heartmender” which in reality is 2 shots of espresso. TasteBudA got the Peanut Buddha Latte. The latte had a little nut crumble atop the frothy cup. I wasn’t sure if it was supposed to be a peanut butter flavor or a peanut brittle flavor. Regardless, it perked up TasteBudA enough before we got in the longest food truck line at the event – the PghTacoTruck line. The menu for the PghTacoTruck was perhaps the most extensive of all the trucks in the roundup, offering everything from a standard taco to vegetarian (maybe even vegan) options. WIth such a variety, it was tough to decide. 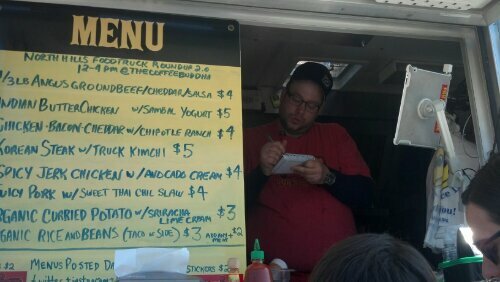 PghTasteBudA got the Korean Steak with truck kimchi for $5. I got the Juicy Pork with sweet thai slaw for $4 (both pictured above). While I’ve had poor success using raw corn tortillas at home, the taco truck knows what he’s doing. The tacos were served on a double tortilla base which was perfect to stand up to the juicy meat fillings. 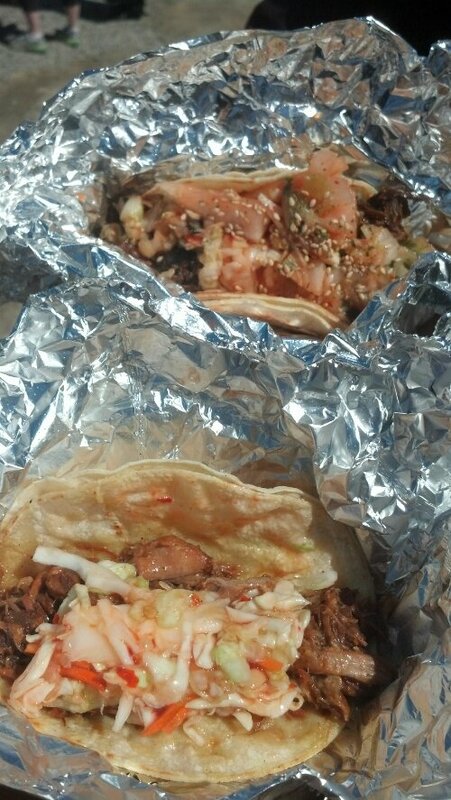 We’d highly recommend the PghTacoTruck to anyone in the north hills throughout the week. They can be found at Coffee Buddha every Wed-Sat from 12pm-8pm. Follow @PghTacoTruck on twitter for special event appearances and variations in schedule.